Surveys conducted by the S.C. Department of Natural Resources (SCDNR) have documented another good nesting season for wood storks (Mycteria americana) in South Carolina. Biologists and volunteers monitor nesting success in several index colonies and, in the colonies that were monitored, an average of 1.7 chicks per nest survived until they were old enough to fly. The federal recovery goal for wood storks is an average of 1.5 fledglings per nest. Storks nested in the following counties in 2016: Beaufort (eight colonies), Charleston (four colonies), Colleton (three colonies), Horry (three colonies), Georgetown (two colonies), Bamberg (one colony), Berkeley (one colony), Hampton (one colony), and Jasper (one colony). "The number of wood stork nests counted in South Carolina during 2016 (2,512 nests) broke the previous record of 2,501 nests set during 2014," SCDNR Wildlife Biologist Christy Hand stated. "The three and five-year averages of the number of stork nests counted in South Carolina were 2,503 and 2,277, respectively. Chick survival was slightly lower than during the past two years due to less favorable timing of rain." 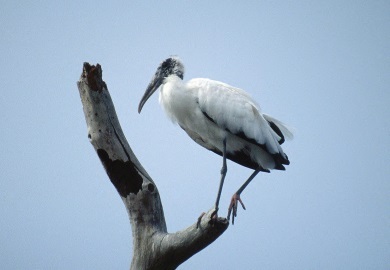 Historically, wood storks used South Carolina as a feeding area during the summer and fall after dispersing from nesting colonies in Florida and Georgia. After much of their habitat in southern Florida was altered and lost, wood storks gradually began to expand their nesting range into South Carolina and more recently into North Carolina. In 1981, the first successfully nesting wood storks were documented in South Carolina (11 nests). Since then, their numbers have gradually increased, although nest numbers have fluctuated among years. Southern Florida remains very important for storks during the winter and continues to support a portion of the population during the nesting season. During 2014, the U.S. Fish & Wildlife Service announced its decision to down-list the federal status of the wood stork from endangered to threatened because several recovery criteria have been met. As a federally threatened species, the wood stork is still protected under the Endangered Species Act. Details about the reclassification can be found in an online news release from the US Fish & Wildlife Service. Storks typically nest in trees growing in water or on small islands. Alligators living below stork nests deter raccoons and other mammals from preying upon the stork eggs and chicks, and rain during the months leading up to the nesting season increases the amount of fish and other food that is available to nesting storks. "Unlike herons and egrets, which hunt visually, wood storks are tactile feeders, which means that they hunt by feeling for fish, crustaceans, and other prey," Hand explained. "In order for the storks to nest successfully, prey must be abundant and available throughout their nesting season."